A healthy economy requires a fluid labor market. Even when total employment and output are stable, the labor market is in constant motion. Jobs disappear when firms close or downsize. Other jobs appear when new firms open or old ones expand. People move freely from one job to another in search of career advancement or better fit between their work and their personal lives. Unfortunately, the US labor market is becoming less fluid. We can trace part of the decrease in fluidity to outside factors like an aging labor force and changing business practices, but much of it stems from ill-considered labor market policies. 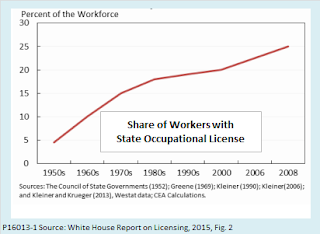 Of these, one of the most damaging is the spread of occupational licensing over recent decades. As we will see, Democrats and Republicans share the blame. How can we measure labor fluidity and why do we care? The job reallocation rate is the sum of the number of jobs created at new and expanding firms each calendar quarter and jobs destroyed at firms that close or downsize. Newly created jobs include both those that are immediately filled and job openings that become newly available but not yet filled. The worker reallocation rate is the sum of the number of hires, quits, and layoffs. It includes people who move directly from one job to another; those who move from a job into unemployment or out of unemployment into a job; those who leave a job and, at the same time, leave the labor force; and those who enter the labor force and immediately take a job. Churning is the amount by which the worker reallocation rate exceeds the job reallocation rate. If people changed jobs only when their current job disappeared and took only newly created jobs, the rate of churning would be zero. The rate of churning, then, represents job changes that are motivated by career advancement opportunities or personal choices, rather than forced by job creation or destruction. The following chart from Davis and Haltiwanger shows that all three measures of fluidity have been decreasing in the United States. Their paper includes many more charts showing decreases in other measures of fluidity, decreases in underlying indicators like quits and hires, and decreases by state and demographic group. The decreases in fluidity have been widespread, but they appear to have affected men more than women and less educated workers more than those with college educations. Key aspects of the decline in labor fluidity appear to be unique to the United States, or at least more pronounced here than in other advanced economies. In some respects, the decline in labor fluidity is a benign result of structural changes in the US economy. One such factor is the aging US labor force. 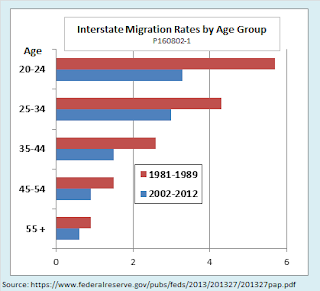 Younger workers have much higher rates of churn and interstate migration as they move from job to job seeking a better match of their skills with employer needs. Another trend that is partly, but not entirely, benign is a gradual shift toward larger and older firms, which have lower rates of employee turnover. In other regards, however, a more rigid labor market is a cause for concern. A decrease in opportunities to switch jobs makes it harder to match skills to the needs of employers. Longer spells of job search raise the unemployment rate. If workers who lose jobs encounter barriers to moving to new ones, they are more likely to withdraw from the labor force altogether, so labor force participation falls. As recently as the 1950s, fewer than five percent of all jobs required an occupational license. Licensing, mostly administered at the state level, was largely limited to professions like law and medicine where the ability of consumers to judge the qualification of practitioners was low and the risk of harm from incompetent providers was high. The overthrow of the medieval guild system was an indispensable early step in the rise of freedom in the Western world. It was a sign of the triumph of liberal ideas, and widely recognized as such, that by the mid-nineteenth century, in Britain, the United States, and to a lesser extent on the continent of Europe, men could pursue whatever trade of occupation they wished without the by-you-leave of any governmental or quasi-governmental authority. Friedman went on to argue that the supposed benefits of licensing are largely illusory while its costs, arising largely from the suppression of competition and innovation, are great. He explained why that was true even for the profession of medicine, where that case of licensing is superficially the strongest. More recent research, summarized in a 2015 White House report, agrees that the relation of costs to benefits is unfavorable for most occupational licensing. Unimpressive cost-benefit ratios are not solely the result of the high costs of licensing. The White House report notes that licensing frequently fails to deliver promised benefits because licensing boards are often lax about monitoring quality of incumbent practitioners or imposing disciplinary measures when consumers complain. That would be consistent with the hypothesis that boards are more interested in protecting practitioners from competition than protecting consumers. Today, despite critics' warnings, licensing has spread to many relatively mundane professions like interior decorators, hair braiders, and florists, where the risk of harm to consumers is low and the remedy of refusing repeat patronage (supplemented by negative online reviews) would seem sufficient to weed out incompetent practitioners. One of the most outspoken contemporary critics, economist Lawrence Kleiner of the University of Minnesota, concurs with Friedman in comparing occupational licensing to medieval guilds in that the main purpose of both institutions is to drive up incomes of incumbent practitioners by limiting competition from new entrants. The following figure from the White House report shows that the share of the labor force requiring a state occupational license had grown to a quarter by 2008. Some researchers estimate that when federal and local occupational licensing is included, coverage rises to a third of all workers. The fact that most licensing occurs at the state level creates strong barriers to interstate mobility for licensed workers. 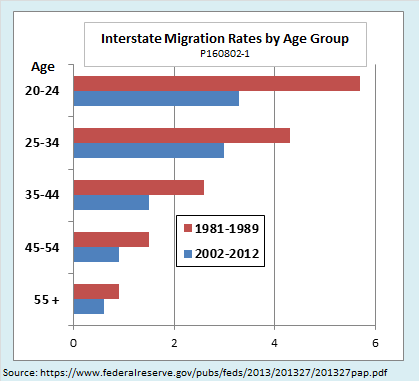 The next chart, from the same White House report, shows the difference in migration rates among professions. Qualifying for a license can take months, if not years, and require many thousands of dollars. In Minnesota, Kleiner notes, it takes more hours of classroom instruction to become a cosmetologist than to become a lawyer. Furthermore, requirements vary widely from state to state. For example, according to a study from the Institute for Justice, obtaining a license to braid hair requires 2,100 hours of coursework in South Dakota but just six hours in South Carolina, while 20 states do not license braiders at all. 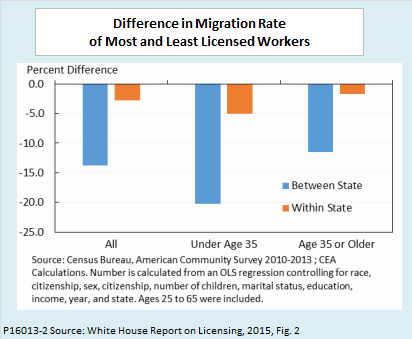 Some categories of workers are more likely to be adversely affected by licensing than others. For example, the White House report notes that the burden is especially onerous for spouses of members of the military, whose duty requires more frequent relocation. As I noted in an earlier post, trade-displaced workers are another category especially likely to feel an adverse impact from licensing. Even those who did not previously work in a licensed occupation can be affected. For example, the family of a displaced worker may become dependent on the income of a spouse who is a licensed manicurist or pest control worker. If the trade-displaced worker moves to a new state to get a factory job, the spouse may face requalification costs and a significant period out of work. Workers displaced by technological change, rather than trade, are in a similar position. Ex-offenders are still another group who are especially hard hit by licensing. Ex-offenders have difficulties finding jobs of any kind, but the fact that they are barred outright from many licensed professions further limits the number of jobs open to them. The White House report and independent researchers like Kleiner agree that certain best practices could reduce the impact of licensing on labor market fluidity without endangering consumers. Among those practices are limiting licensing to cases where there is a high risk of consumer harm from unlicensed practitioners, balancing the costs of licensing against its benefits in order to eliminate unduly burdensome requirements, and harmonizing licensing standards among states. As a small step in the right direction, the White House recently announced that it would provide $7.5 million in grants to organizations interested in working with states to reduce overly burdensome licensing and make it easier for licensed practitioners to work across state lines. Advocates of a best-practices approach to reform maintain that for many professions, certification rather than licensing could adequately protect consumers against shoddy work and outright fraud. Certification, like licensing, sets standards and informs consumers, but unlike licensing, it does not bar uncertified practitioners from entering the market. Certification is especially appropriate where consumers can easily change providers if they are not satisfied, and where the likelihood of severe harm from a single unsatisfactory experience is small. Suppose, for example, that you are looking for a yoga teacher. Some people might be content to rely on word of mouth or a penciled notice on a community bulletin board, but others might want some advance assurance that the person they hire really knows what they are doing. With that in mind, a national organization, the Yoga Alliance, maintains a register of yoga teachers and yoga schools that meet the organization’s standards. In the case of individual teachers, that means completing a 200-hour course of study at an approved school for an "RYT 200" designation or 500 hours for an "RYT 500" designation. The process, however, is entirely voluntary. The organization makes no effort to keep teachers or schools that do not meet its standards from competing with those who do. In fact, the Yoga Alliance actively opposes the efforts of some states to introduce mandatory licensing of yoga schools and teachers. First, the Alliance points out that yoga is an inherently safe activity—safer than many popular sports that face no licensing requirements. Second, it argues that yoga is so diverse that licensing would inevitably reduce consumer choice. Third, it maintains that government officials are not qualified to develop appropriate standards for a practice that has deep historical and spiritual roots. Policy experts across the political spectrum support reform of occupational licensing. Who is to blame, then, for the fact that state legislatures regularly ignore calls for best practices? Can we point the finger at Democratic-controlled legislatures, wedded to an assumption that bureaucrats can make better decisions than consumers and markets? Can we instead blame Republicans, quick to pander to lobbyists for protected professions? Neither party, it turns out, holds a monopoly on blame. Excessive licensing is endemic in red states and blue states alike—a case of bipartisanship gone bad. 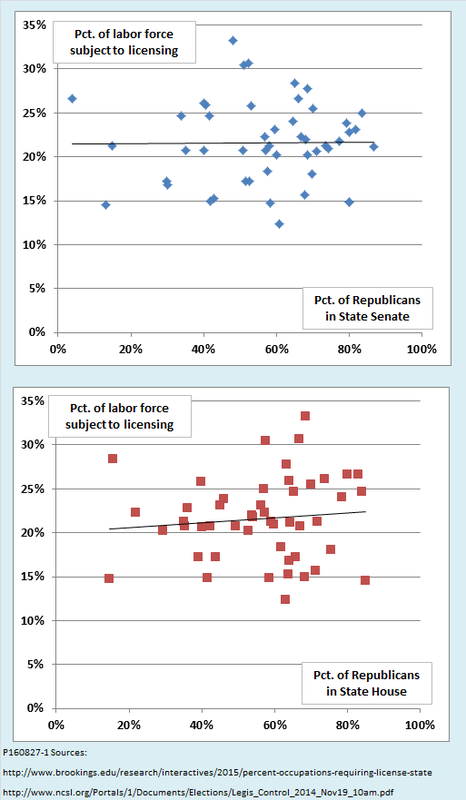 The slight positive relationship between licensing and Republican representation is not statistically significant. 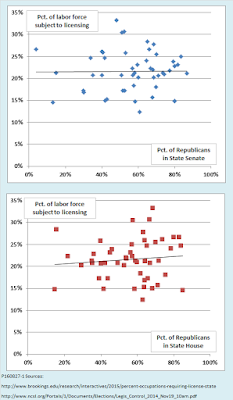 Interestingly, if we look at the two legislative branches together, licensing is slightly more widespread (23.6 percent of the labor force) in states with split legislatures than it is either in states where both houses are controlled by Republicans (21.3 percent licensed) or both by Democrats (20.7 percent licensed). At the extremes, the most licensed state is Iowa, where the legislature is split, whereas the two least licensed states are strongly Republican South Carolina and strongly Democratic Rhode Island. 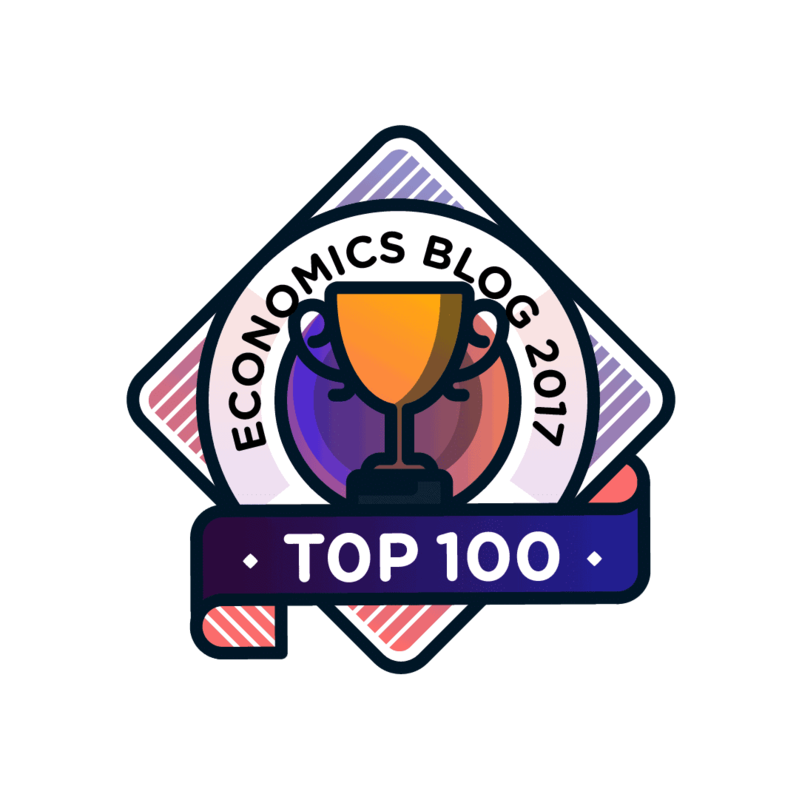 Occupational licensing, as currently practiced in the US, has few friends in the economics profession. Its most enthusiastic advocates would like to see it limited to occupations where the risk of substantial harm to consumers is great and the ability of consumers to make an informed choice among providers is limited. Its most persistent critics would like to replace it with simple certification or eliminate it entirely. 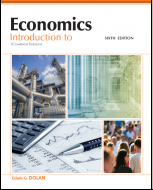 Among economists, both advocates and critics agree that excessive licensing reduces labor market fluidity to the detriment of efficient resource allocation. State legislatures, however, are decidedly more license-friendly. Too often, incumbent practitioners of licensed professions, who benefit from the reduction in competition, have been better organized and more effective in their lobbying than consumers. However, there appears to be a growing awareness of the need for reform at the national level. Recent White House efforts to encourage research into best practices are a positive step. Prominent think tanks from across the political spectrum have also spoken out against the spread of licensing. Can a policy that is unanimously opposed by the conservative Heritage Foundation, the liberal Progressive Policy Institute, and the libertarian Reason Foundation last forever?